A depressingly large number of people posting in various social media channels are hammering away right now at a campaign that tries to characterize the Palestinian Arab teen Ahed Tamimi as a victim of Israeli oppression, a human rights activist and a freedom fighter. She's the young woman many call Shirley Temper, a photogenic performer who for at least eight years now has been the central figure in a long-running propaganda performance orchestrated by her father Bassem Tamimi and his publicity business, Tamimi Press. What others say about this is very much on our minds. What Bassem Tamimi himself says is a matter of record. Child abuse? Manipulation? Ha! The ugly child abuse in which he and his village engage chronically is dismissed in masterful fashion: "Our children are doing their duty and must be strong." 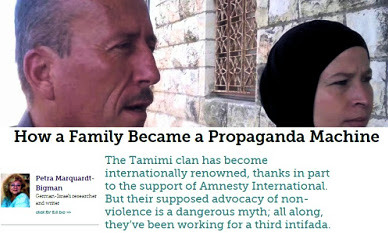 We keep running into people who think they know the story of the Tamimi clan. 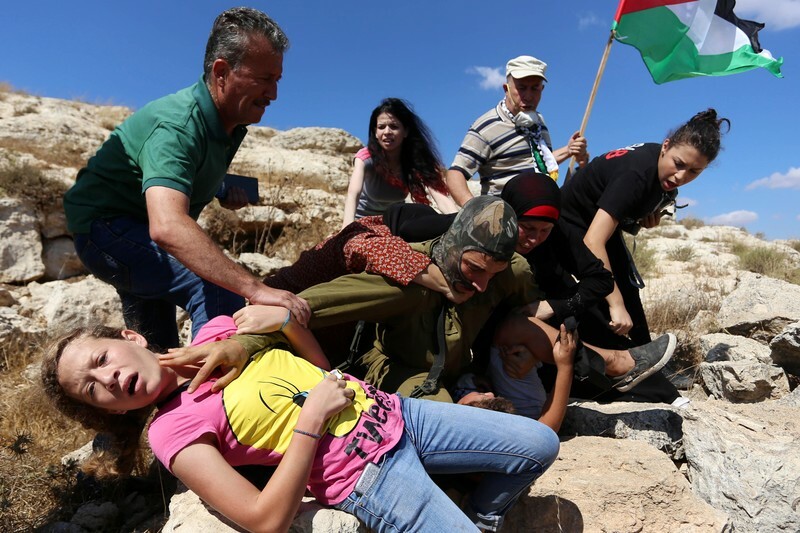 But it's clear to us that few understand the rich and ugly detail of their hatefulness, expressed not as mere protest and words but the kind of physical violence that has ended dozens of lives on the Tamimi side and among their many victims. 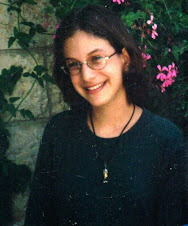 Regular readers of this blog know our oldest daughter Malki was murdered at the age of 15 in a massacre engineered by Bassem Tamimi's niece, Ahlam Tamimi. 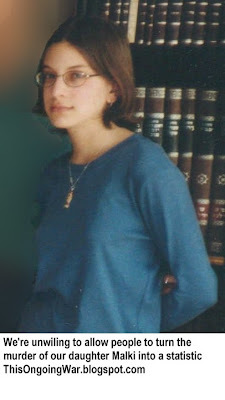 Since March 2017, she has been a fugitive from US justice, wanted by the FBI to face federal charges in Washington arising from the bombing/massacre of the Sbarro pizzeria in Jerusalem 16 years ago. She has confessed often and in great detail about her role as the mastermind of the slaughter. 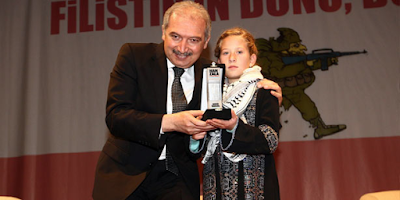 Meanwhile Bassem Tamimi has been crowned a hero of Amnesty International. They sent him on a coast-to-coast roadshow in 2015. We tried to get some straight answers from him and from his generous sponsors at the time to some straightforward, related questions... but all we got was ignored: see "04-Sep-15: Mr. Human Rights Defender, a question if we may". 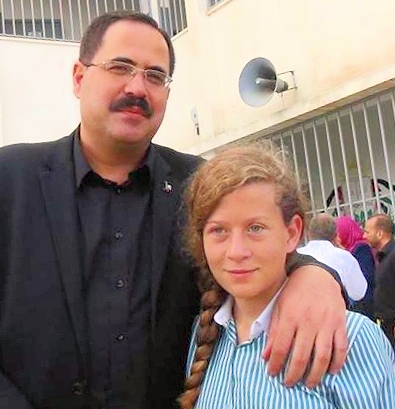 But Ahlam Tamimi, the confessed murderer, along with her uncle and aunt and cousin Nariman, Bassem and Ahed, are simply part of a long list of Tamimis associated with Arab-on-Israeli terror. Some of the details have been deliberately obscured or hidden. We have been doing what we can to publicize them. We revisited some of the barely-known details just a few days ago - see "19-Dec-17: Uncovering some of Nabi Saleh's hideous buried secrets". 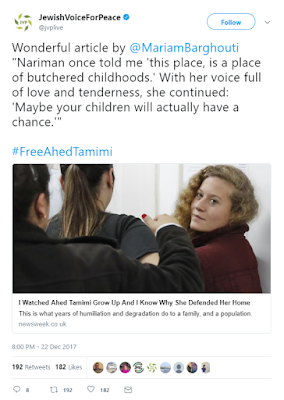 On any objective view, enthusiasm for the "bravery" of Ahed (sometimes written Ah'd and Aahd) Tamimi is a strange thing because of how it ignores the trajectory of her emergence as a media figure and the center of a multimedia "Free Ahed Now" project. How old is she? Depends whom you ask. She was 12 in September 2011 [quoted by Israellycool from an Arab source]; 8 in August 2012 [Source: +972, a far-left Israeli site]; 13 in December 2012 [Source: TimeTurk News and other Turkish sources]; 10 in December 2012 [Source: World Bulletin]; 13 in June 2013 [Source: Your Middle East]; 12 in February 2014 [Source; The Guardian]; 14 in September 2015 [Source: NBC News]; 16 in February 2017 [a South African source]. Thus she was born (in the same order as those links) in 1999, 2004, 1999, 2002, 2000, 2002, 2001, 2001. It's hard to be precise. And to be clear, it's fair to assume all this vagueness is intentional. We have pulled together some images (below) from public sources that chart the process by which her family and her village - but most of all her parents - cultivated a media-ready provocateur. It's a dismaying chronicle not only because it shows how there are loathsome people who, even though they are parents, would do this to a child. But also because of the individuals, a distressing number of them progressive Jews, who have embraced this distressing and very obvious child-abuse while giving no sign they see the malice, the hate, the bigotry and the overt and calculated manipulation that has accompanied it from the outset until today. 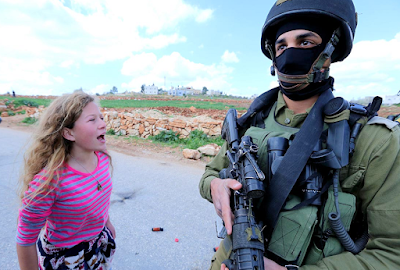 ▲ July 2, 2010: Screaming on demand for her father's cameras and just 9 years old, Ahed Tamimi is confident enough to walk up to a fully armed soldier and shriek into his face. It's very likely someone told her not to worry, everything will be OK, just show fierce little-girl anger while the cameras roll. And so a career is launched. See more in this video from which the photo above was screen-captured. And here: "06-Sep-15: The making of a pigtailed provocateur". Watch carefully and you can see the child's mother in the same video clip. Mostly - since she has much less to offer than her child does - she stays out of camera range. 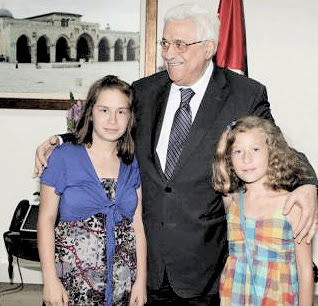 ▲ September 2012: The CAMERA caption reads: "Mahmoud Abbas congratulates A'hd (right) and her cousin Marah for their "bravery" (From the Nabi Sabeh Solidarity blog)"
▲ June 16, 2012: Ahed Tamimi on stage in Amman, Jordan, gazes longingly at her role-model cousin and Nabi Saleh's pride and joy, the boastful and confessed murderer-who-got-away-with-it Ahlam Tamimi. 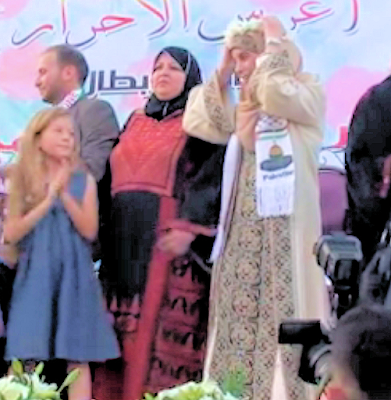 The occasion is the wedding of the Tamimi woman with another Nabi Saleh murderer (who is also the bride's cousin as well as little Ahed's cousin), Nizar Tamimi, the male in the photo. Everyone in the picture is a blood-relative of everyone else. 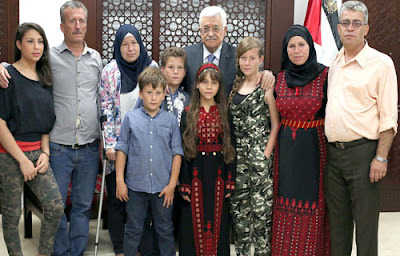 As the published videos and photos attest, many members of the Nabi Saleh Tamimis traveled to Jordan to be present. Background: "22-Jun-12: A wedding and what came before it"
▲ March 17, 2013: That's Ahed in the bottom row among the other eager "peace-makers" of Nabi Saleh. Her father and chief manipulator Bassem Tamimi is at top left; her mother Nariman Tamimi in the bottom left corner. Everyone's a relative. Some people read this and think the Tamimis are talking about some future activity of a peaceful nature. A reminder that in the so-called second Intifada, the death toll among Israelis was huge; among Arabs, substantially larger. Background: "17-Mar-13: A little village in the hills, and the monsters it spawns". 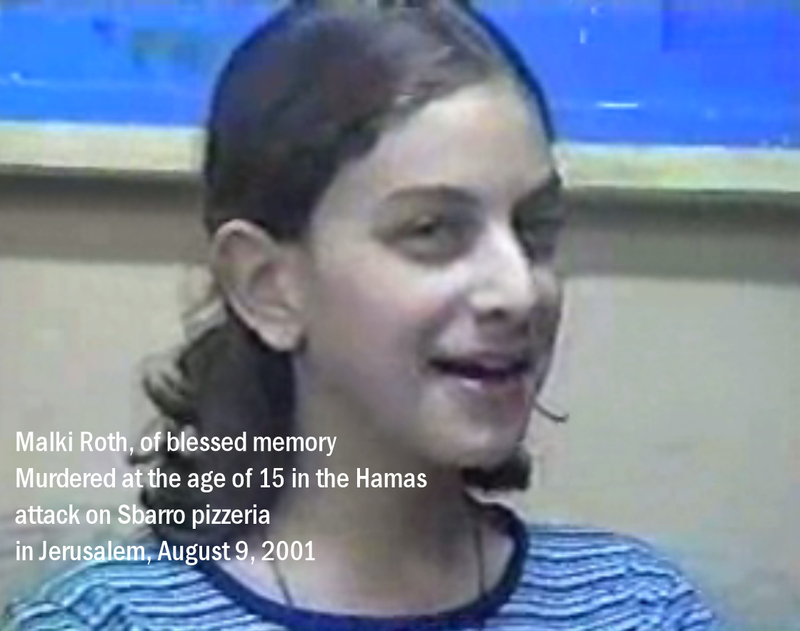 And this follow-up: "29-Aug-15: Revisiting a Palestinian Arab village and its monsters". And another: "01-Sep-15: A tale of two villages: one devoted to non-violence, another that actually exists". 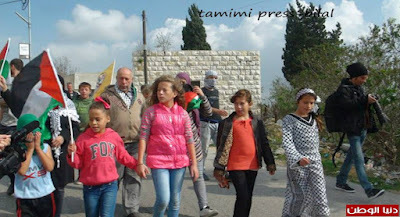 ▲ September 3, 2015: Not to be outdone by his boss, Sabri Saidam, the Palestinian Authority's minister of education visits the little town of Nabi Saleh to get a grip on developments there. Background: "10-Sep-15: It takes a village: The passion for violence of the peace-loving Tamimis"
▲ November 2015: Bassem Tamimi, Ahed's father, is paraded around the US by Amnesty International, In Ithaca, NY, where this photo is taken, he addresses an audience of school-children from Grade 3. 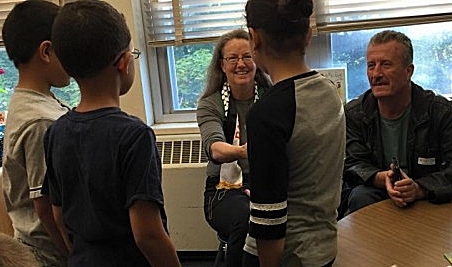 There's outrage in the city ["School District: Ithaca 3rd graders exposed to anti-Israel rhetoric in the classroom" and "Judge sends Ithaca schools a message over pro-Palestinian speaker"]. Shortly afterwards, his visa to enter the United States was permanently revoked by the Obama administration. 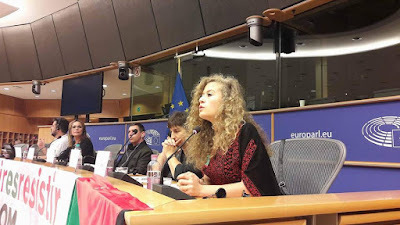 ▲ Some months ago, Ahed Tamimi addressed a committee of the European Parliament. The idea of referring to Nariman Tamimi, Ahed's mother, as a person with a "voice full of love and tenderness" is delusional. Don't believe us? Check out "02-Oct-15: Truth, honesty, love, murder... and useful idiots". As to "butchered childhoods", we happen to know something about how that works. Our daughter Malki, who never thrust a fist into the face of anyone at all let alone a soldier, was fifteen when she became an unwilling participant in the explosive moment which the Tamimi clan celebrate yearly with such huge enthusiasm. 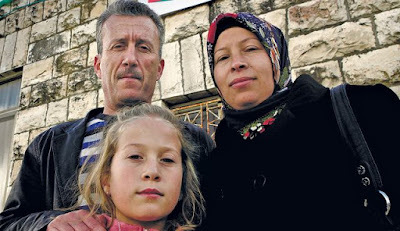 Our murdered daughter Malki's picture (above) stands for the absolute opposite of what the Tamimi propaganda machine is marketing: goodness, kindness, concern for others, embracing the different and the weak and the damaged, always optimistic. It's tragic how many people fail to understand that simple truth. An utterly sick and depraved family. Arnold you and your family continue to act with the dignity we have come to expect, despite of the provocation this heinous family and their well versed propaganda machine. It's scary how convincing that horrible child is. Media is often so far from the truth. So sorry for the loss of your innocent child. 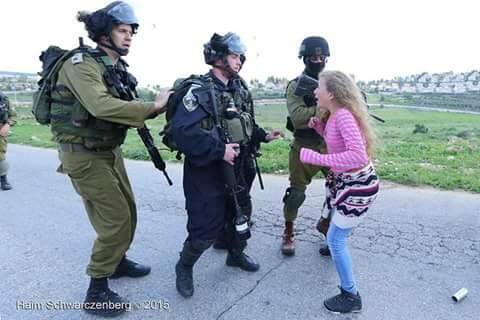 HaShem will punish them as much as he will bless your daughter. I wish you long life. I was shocked that media usually doesn't mention that Bin Laden's teacher and mentor was some insane Palestinian from the so called "West Bank" who's name was Abdullah Azzam and it seems that he was the founder of Al-Qaeda and that he thought of it first, according to the article... the article mentions that he was called “the Lenin of international jihad”. I don't think I heard anything about that before in the media. I also tried to look it up on Wikipedia and it also said that he (Abdullah Azzam) was also known as "Father of Global Jihad". And I'm just shocked that western media doesn't seem to be talking about it much, to spread awareness about it... most people probably never even heard that name before. 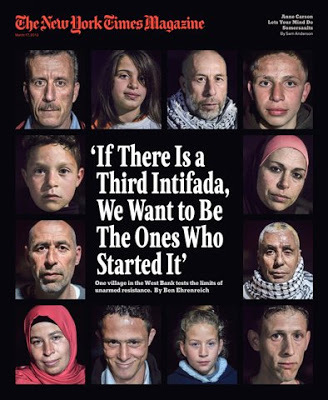 When I saw that, I though: Does the western media avoid talking about it because it goes against the pro-palestinian "narative" where they play "victims" who are just "upset" because their village is "occupied" or something like that? Why haven't more people heard about how a "Palestinian" was called “the Lenin of international jihad” and how he was Bin Laden's teacher and mentor? And it's scary that some Islamic YouTube channels seem to be promoting his crazy speeches, while most non-muslims don't seem to have even heard about who that "Palestinian" maniac was.